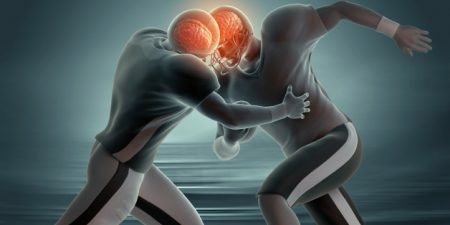 In a small 2014 study in the Journal of Neurotrauma, researcher Thomas M. Talavaga and colleagues reported that repeated head trauma that did not produce concussion symptoms was still associated with neurocognitive and neurophysiological changes to the brain in high school football players. The longitudinal study tracked ‘collision events’ experienced by 11 teens who played football at the same high school. The young men also completed neurocognitive testing and magnetic resonance imaging (MRI) scans of their brains over time. The researchers expected to see the participants fall into two categories: those who had no concussions and normal neurological function, and those who had at least one concussion and subsequent neurological changes. They ended up observing a third group: young men who had not exhibited concussion symptoms, but nonetheless had measurable changes to their neurological functioning, including impairments to visual working memory and altered activation of the dorsolateral prefrontal cortex. Young men in this last group had had more collisions that impacted the top front of the head, directly above the dorsolateral prefrontal cortex. The authors suggest that the discovery of this third category mean that some neurological injuries are going undetected in high school football players. The players who are injured in this way are not likely to seek treatment, and may continue playing football, risking more neurological brain injury or brain damage with subsequent collisions. 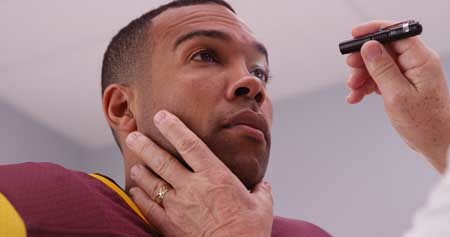 Professional football players face repeated mild traumatic brain injuries throughout their careers, and may face a variety of brain impairments, from depression to dementia, as a result. A recent study by researcher Jennifer Coughlin and colleagues clarified how these impairments may be caused by repeated brain impacts. The researchers used positron emission tomography (PET) scans to observe the volume of translocator protein, a marker of brain injury and repair, in the brains of seven active or recently retired National Football League (NFL) players. Compared to healthy, athletic volunteers who were age-matched to the NFL players, the NFL players showed greater volume of translocator protein in several brain regions, including the left and right thalamus, the left and right temporal poles, and the brainstem. It is not yet clear whether the increased volume of translocator protein is a sign of the brain’s attempts to repair itself, or whether it shows deterioration toward chronic traumatic encephalopathy. Translocator protein is also considered a marker of microglial activation, which occurs with inflammation. High levels of translocator protein have also been seen in patients with depression and schizophrenia.